Back in 1987, Firestorm writer John Ostrander made a dramatic and risky change to the lead character of the series. For nine years, Firestorm had existed as the combination of the youthful Ronnie Raymond and the brilliant Professor Martin Stein. While merged, Raymond was in command of the Firestorm form with Stein a voice of reason inside his mind. This was the status quo for the character. Gerry Conway had created the character in 1978 and had remained the primary writer of Firestorm’s adventures up until late 1986. At that point, John Ostrander took over the series. Less than a year on the book and Ostrander changed its very foundation. 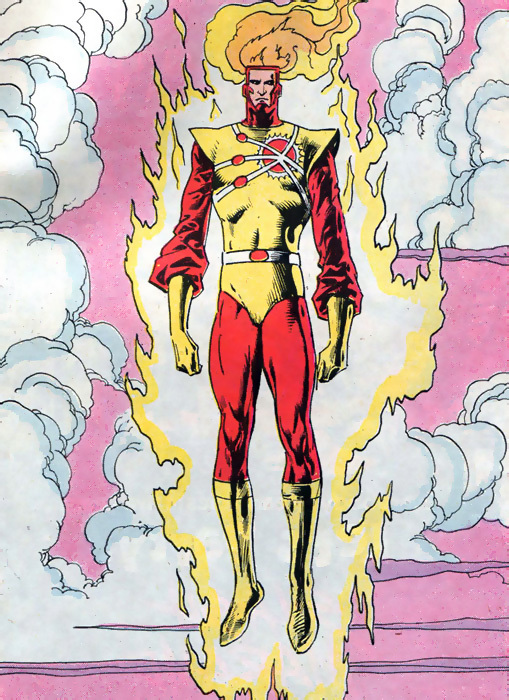 The second incarnation of Firestorm (or as I call him, the “blank slate” Firestorm) doesn’t get talked about very much nowadays. I think it’s important to remember this version of the character because it was the first time the Firestorm matrix had been changed in a major way. Since then, change has become a hallmark of the character. Regardless of whether someone enjoyed this era, it’s important to recognize the significance of the change and that for nearly two years this was the hero known as Firestorm. If you ever go back and re-read crossovers like Millennium or Invasion, you’ll find this was the version of Firestorm present for those stories. Ostrander’s first major story arc pitted Firestorm against the world. Acting on a suggestion from a terminally ill Professor Martin Stein, Firestorm demanded the U.S. and the Soviet Union destroy all of their nuclear weapons. After tussles with the Justice League and most of his enemies, Firestorm faced off against a Russian nuclear man named Pozhar. Pozhar had been Mikhail Arkadin, a nuclear technician and survivor of the Chernobyl accident now cursed with nuclear powers. In Firestorm The Nuclear Man Annual #5, Pozhar and Firestorm battled in the Nevada desert. Meanwhile, the U.S. government decided that the nuclear man had become a threat. The U.S. military then proceeded to drop a nuclear bomb over Firestorm and Pozhar, blasting the whole area way. When the smoke cleared, a new Firestorm emerged. The image below by Joe Brozowski was the final panel from Firestorm The Nuclear Man Annual #5 and our first glimpse of the new Firestorm. The changes to Firestorm’s physical appearance were subtle. He’d grown four inches taller, his headgear had gained sideburns-like accents, his body had become skinnier, and his facial features and costume lost some definition. While cosmetically he looked very similar, his internal make-up was drastically different. The Firestorm matrix was now composed of Ronnie Raymond and Mikhail Arkadin. Professor Martin Stein was nowhere to be found. Surprisingly, Ronnie Raymond was no longer in control of the Firestorm form. Whenever they were merged as Firestorm, both Raymond and Arkadin were trapped inside the fused body unable to affect its actions. The being in control of the Firestorm form was independent from Raymond and Arkadin and acted very detached. The new Firestorm had his own personality and desires, yet he seemed to lack any life experience and had no memories. He was a blank slate. Both Ronnie and Mikhail had the ability to initiate the merger of Firestorm, regardless of the distance between them. Whenever Firestorm was no longer needed, he would separate back into Raymond and Arkadin, returning them to where they originated. Typically Ronnie would return to the United States and Mikhail would return to the U.S.S.R. Firestorm still functioned as a superhero, but often seemed confused about the situations he was involved in. As Ron and Mikhail only formed Firestorm when there was a crisis, the Firestorm entity wondered if his only purpose was to fight. About a year after this new incarnation of Firestorm came about, it was discovered that the “blank slate” personality of the new Firestorm was in fact the amnesiac mind of Professor Martin Stein. Though his physical body didn’t join them to create the new Firestorm matrix, his subconscious mind was in control of the Firestorm body. Stein was found to be suffering from amnesia and living in a Nevada mental institution. 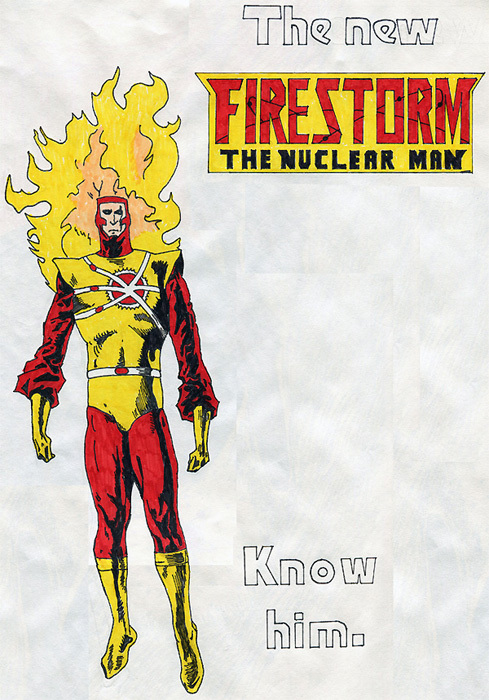 The “blank slate” Firestorm was part of the series from Firestorm The Nuclear Man Annual #5 (Oct 1987) through Firestorm The Nuclear Man vol II #84 (Apr 1989). This nineteen month run was drastically different from the previous nine years. While Firestorm still battled supervillains, they also tackled socially-conscious issues like nuclear weapons and famine. Several stories also took place in Moscow, this being just before the end of the Cold War. To help draw attention to the change in the direction of the series, DC ran the house ad below in November 1987. I’m not sure who the artist was for this ad, but I don’t believe it was series artist Joe Brozowski. The advertisement was fairly small (only 1 inch by 3 inches) and was run on the letter column page. Below you’ll find a drawing I did back in 1988 of the “blank slate” Firestorm that I recently unearthed. I had been inspired by the changes, so I decided to try my hand at drawing the new character. I drew it free hand, but based it upon a combination of the artwork above from Firestorm The Nuclear Man Annual #5 and the advertisement. My drawing measures 13 inches by 17 inches. Please forgive the patchwork-looking white background. The original image is so large that I had to do multiple scans and pieced them together digitally. As I mentioned, for the first year of the “blank slate” Firestorm, Professor Martin Stein was nowhere to be found. It was assumed that he was killed in the nuclear blast that created the new Firestorm. In Firestorm The Nuclear Man vol II #75, Professor Stein was found alive in a Nevada mental institution completely cured of his terminal brain tumor. Stein had no memory of his previous life and was unaware of the part he played in the “blank slate” Firestorm. The institution staff had no idea how to diagnose Stein as from time to time he would fall into a coma-like state for no apparent reason. Unbeknown to them, these were the times when Firestorm merged and Stein’s subconscious mind was in control of the Nuclear Man. The original artwork below comes from our friend Jon over at Fizzit, the Firestorm-themed blog. 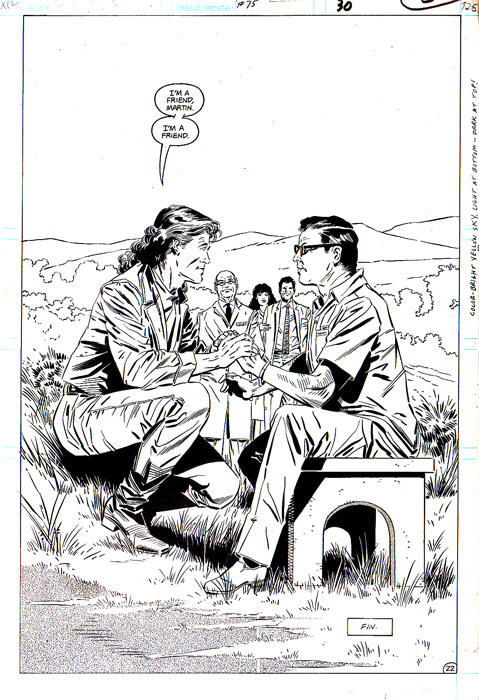 This was the last page of Firestorm vol II #75 drawn by Joe Brozowski. Ronnie Raymond and the amnesiac Professor Martin Stein were finally reunited after a year apart. When issue #75 was published, I felt this single panel was the most emotionally-moving scene in Firestorm’s publishing history. Our thanks to Jon for allowing us to reprint this page here. Click the image to enlarge. Posted in: Advertisements, Comic books, Firestorm #01: Original (Ronnie/Martin), Firestorm #02: Blank Slate (Ron/Mikhail/Stein), Firestorm comic vol. II, Joe Brozowski, John Ostrander, Mikhail Arkadin/Pozhar, Professor Martin Stein, Ronnie Raymond, Sketch/Art. I think I made a comment here some time ago about Ostrander that I regret. It was nothing personal and I didn’t like hearing that he was in a health crisis, but I wasn’t a fan of the changes, mostly because I thought the Martin/Raymond matrix was fantastic. Firestorm was youthful and funny and although inexperienced, one of the most powerful figures in the entire DCUC who could go head-to-head with someone like Superman and come out on top. I think the changes came about because the series wasn’t doing well at the time and I admit there were nice things about it. The fact that Firestorm was a kind of elemental with Swamp Thing and Red Tornado held some interest, albeit short-lived. For a young character who broke into the ranks of the illustruous JLA and even appeared in the legendary Super Powers show, I think nine years was not enough of a run to so drastically change my favourite childhood hero. This wasn’t a simple costume change like Green Arrow has seen, this was a massive change, much like killing a character and replacing him with someone else. It’s strange being a man in my 30s and having such an emotional response to it but my inner child still reacts to it. Oh I agree completely, outburst. I had the same visceral reaction, but mine was to the changes in the Stern/Lyle version of Starman, which was only 5 years old, not even 9 like Firestorm. To this day I detest Strazewski and Robinson.